Above: Screengrab of Reclaim the Records homepage. 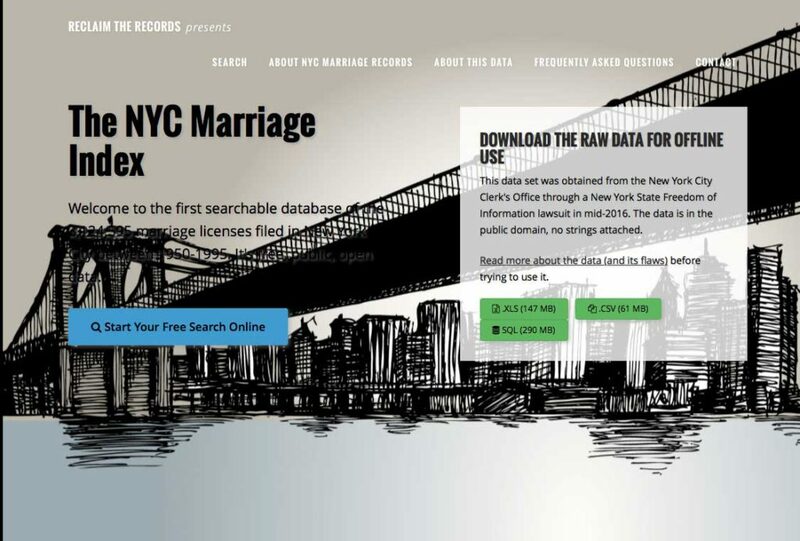 This fall (2016), a U.S.-based grass-roots organization called Reclaim the Records (RTR) celebrated its first major victory by opening a website (www.nycmarriageindex.com) to allow the public to search the indexes of New York City marriage records from 1950 to 1995 for free. The records were previously accessible only in a single location, the New York City Clerk’s Office. Utilizing the New York State Freedom of Information Law, RTR engaged the City Clerk’s Office in a lengthy court battle to gain access to the indexes for wider public access. “It turns out the City Clerk’s Office really didn’t have any good reason for denying our perfectly legitimate records request, or for ducking our attorney’s phone calls and e-mails, or for generally refusing to hand over the data,” RTR explained on its website after it had received the index on 110 reels of microfilm as well as a text-searchable database. The new online NYC Marriage Index features more than 3.1 million marriage licenses, which refers to more than six million people. While access is still restricted for marriage records less than 50 years old, those older than 50 years are available for ordering.